An ideal shorthanded Cruising Sloop, Designed by Philippe Briand built by CNB yachts in Aluminium. 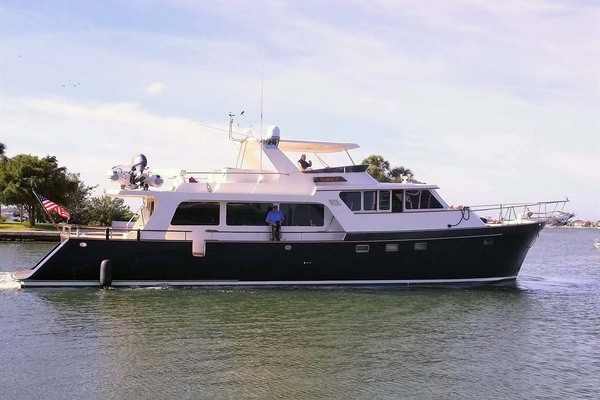 GRACE has three main guest cabin with an additional pilot berth.Comprehensively refitted in two stages 2012 and 2013 / 2014 covering New Awlgrip hull and superstructure paint, new 230hp engine and 18KW generator installed. New pluming, freezers, grey water tanks and new air conditioning. New sails from UK sails. A comprehensive interior upgrade . New tender and 55hp out board engine. United Yacht Sales New Jersey would love to guide you through a personal showing of this 70' Cnb 70 1998. This yacht for sale is located in Istanbul Turkey and priced at $850,000. For a showing please contact us by filling out the form on this page and we will get back to you shortly! GRACE has had a serious refit 2012 - 2014: new deck, new hull and superstructure paint, rig out scanned and painted, new sails, new interior linings and arrangement. new engine & generator. new Hydraulic pack. Linens, Cushions and head liners. nearly new boat!New engine Cummins 230hp 2012New Generator Onan 18kwNew teak decks 2011, new hatches by GoiotNew Electronics Raymarine , 3 Chartplotters, ST70 Repeaters, VHF, etcNew 2 Fridges,Washing Machine , Deep freze, TV etc,New bathroom marble tops , kitchen corian countertop, shower and bath fixturesNew Plumbing and Gray water tanksNew Electrical circuits , switchboard, lighting fixtures, downligh spotsNew Outboard, and dinghy 400 BWA , 55 EvinrudeChart table converted to Pullman berth convertibleNew sails 2011 , UK sailsNew AirCondition 80.000 BTU , MarincoldNew upholstery and fabrics throughoutNew AWLgrip paint and inside teak polishesHistorical works:New caulking on the deck 2008 season, all salt water intakes replaced during winter maintenance 2008 / 9.She was hauled out for 5 months through the winter months.For work on the boat We have put a new interior in the very forward crew cabin with new horizontal leather and new Tecma head. The entire interior of the boat has been re varnished.The paint is Algrip. GRACE Shows remarkable well, she is easy to handlle short handed with a uncluttered deck layout, speedy upwind sailing and very comfortable at anchor.She has been extremely well maintained and following a two year period of improvement 2012 -2014 she is nearly as new.